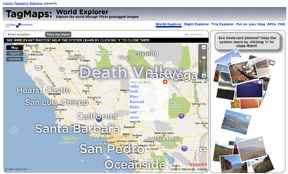 The O'Reilly Radar blog turned me on to TagMaps: World Explorer, a mashup between Yahoo Maps and (recently acquired) Flickr photo sharing service. This is another neat way to explore the world, using the photos of Flickr users to illustrate what makes each location special. You can type in a city or country and are then presented with a map covered in "tags". Tags are the keywords that Flickr users apply to their photos when they put them on the site. These tags, along with "geocode" information (which sets the latitude and longitude where the photo was taken), places the photos on the map. Similar to Google Earth, this is a cool tool for exploring the world, both in your own backyard and around the globe.